Magnetic Resonance Fingerprinting (MRF) depends on spatially and temporally incoherent encoding fields for fast quantitative imaging. However the achievable encoding is limited by hardware. The iPRES concept, which adds ΔB0 and B1+ encoding to a receive array, is an excellent candidate for additional encoding for MRF. 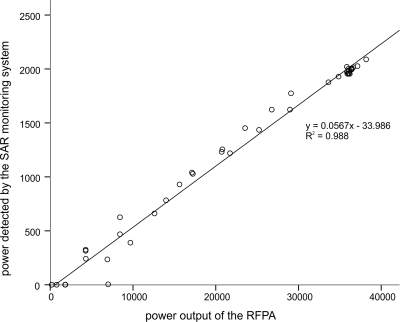 Here we present preliminary results of a 16 channel iPRES array, referred to as the MRF array. The MRF array uses in-bore power amplifiers to provide vastly increased encoding capabilities while minimizing the cost of additional hardware. Such encoding schemes are expected to allow for acceleration of quantitative imaging techniques such as MRF. Body MRI at 10.5T shows potential for improving signal-to-noise ratio compared to 7T, but is limited by increased specific absorption rate (SAR) levels. In this work, the geometry of a dipole antenna is optimized for body imaging with low SAR levels at 10.5T. The optimized dipole geometry is compared to a previous design in simulations on a human model, where it is shown that SAR levels can be decreased by 36% for an equal transmit efficiency. 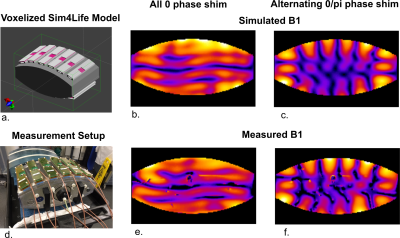 Simulations are validated by magnetic resonance thermometry and B1+-mapping experiments with a 12-channel multi-transmit array. We introduce a new performance metric for RF shimming, the ultimate intrinsic transmit efficiency (UITXE), which provides an absolute reference independent of any particular coil design. We show in simulation that it represents a performance upper bound, which could be approached with finite transmit arrays with an increasing number of coils. In particular, we demonstrated that a 24-channel array could achieve 70% of the UITXE. UITXE could be employed in a straightforward manner in experiments to assess absolute performance of actual arrays and evaluate RF shimming approaches. The associated ideal current patterns could provide new insight for optimal array design. 32-Channel Combined Surface Loop / “Vertical” Loop Tight-Fit Array Provides for Full-Brain Coverage, High Transmit Performance, and SNR Improvement at 9.4T: an Alternative to Surface Loop / Dipole Antenna Combination. Tight-fit human head ultra-high field (UHF,>7T) transceiver (TxRx) surface loop phased arrays improve transmit (Tx)-efficiency in comparison to Tx-only arrays, which are larger to fit receive (Rx)-only arrays inside. A drawback of the TxRx-design is that the number of array elements is restricted by the number of available RF Tx-channels (commonly <16), which limits the Rx-performance. 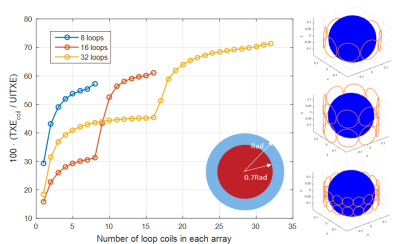 A new 32-element tight-fit human head array, which consists of 18 TxRx-loops and 14 Rx-only vertical loops, was constructed. The array provides for full-brain coverage, ~50% greater B1+, and ~30% greater SNR near the brain center as compared to common Tx-only/ Rx-only (ToRo) array. Evaluation of a 64 channel receiver relative to a 32 channel receiver shows that gains in parallel imaging performance for SMS/MB of 40 to 60% is feasible, such that, highly desirable, single-shot, multislice, whole brain coverage with <1s TR and 1mm or better isotropic resolutions would be achievable at 7T. The implementation of 23Na-sodium MRI in the clinical routine is of increasing interest since it can provide valuable information on tissue viability. A design criterion of such double resonant RF setups is to keep the performance of the 1H MRI approximately at the same level as single resonant setups while optimizing the 23Na imaging. 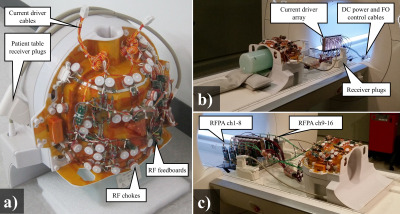 This work investigates the feasibility and performance of a double resonant 8 channel receive (Rx) head coil for 1H and 23Na MRI at 3T using EM simulations and a head model. We describe our experiences implementing a whole-body transmit coil driven by a 35kW RF power amplifier, with a 30-element 31P receive array, and an 8-element 1H transmit/receive array, optimised for cardiac 31P-MRS at 7T. We describe an adaptation to the vendor’s standard SAR monitoring to monitor RF power levels up to the full 35kW output of the RFPA. This new hardware was found to achieve better 31P B1+ and SNR at the depth of the heart than other coils available in our institution. This setup promises to allow the first regionally-resolved, whole-heart 31P-MRSI studies at 7T in the near future. In clinical MRI systems operating at 1.5 and 3T, built-in 1-channel radiofrequency (RF) transmit body coils are broadly used in conjunction with local receive RF coils. 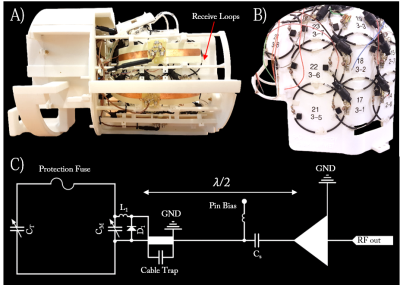 Recently, a 32-channel Tx/Rx remote body coil has been presented for 7T body MRI. In this work we present an additional 16-channel receive-only spine coil to boost signal-to-noise ratio in comparison to measurements where only the 32-channel Tx/Rx remote body coil is used for reception. 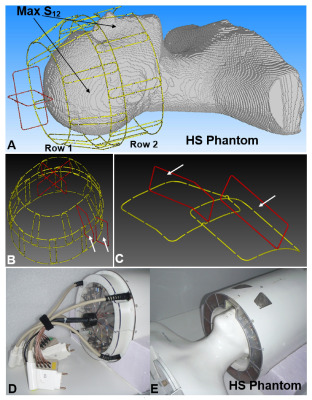 The SNR gain is demonstrated in a body-sized phantom. Furthermore, first in-vivo imaging results for 7T MRI of the spine during free-breathing are shown. Imaging of the breast at 7 tesla is compromised by the inhomogeneous B1+. To overcome this challenge we explored the use of five fractionated dipole antennas in a multi-transmit system in combination with 30 receiver coils. This coil shows larger SNR, larger FOV and higher and more homogeneous B1 field in the breasts than the currently used breast coil at our institute. The high B1+ and an increased field of view achieved by the fractionated dipole antennas, opens the way to translate routinely used breast imaging protocols from 3T to 7T enabling advanced clinical research. To increase the parallel imaging performances while keeping high transmit field, the combination of a high-density receive coil array and a tight-fitted whole-brain dipole coil array was investigated. Measured noise correlation matrix, signal-to-noise ratio and g-factor maps were evaluated for the 31-channel receive coil array, and MRI acquisition time could be decreased up to 3.4 times without attenuation in data quality. MR images demonstrated a large spatial coverage, including cerebellum and cerebral cortex, thanks to the whole-brain dipole transmit array while the 31-channel receive coil array provided highly accelerated image acquisition.